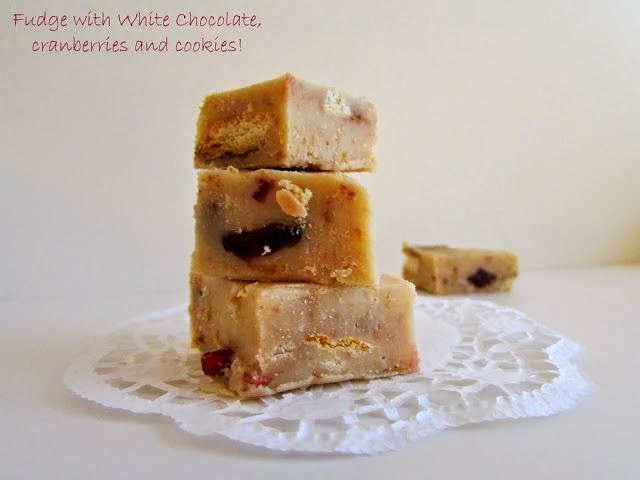 Fudge with White Chocolate, Cranberries and Cookies!!!! Hello my friends!!!! Happy New Year!!!! 2014 best wishes for the New Year!!! I am pretty sure that you had great moments the holidays and I am also sure that you have tasted too many different recipes! I have to admit that I ate a lot this Christmas…. And what is the best way to start this year??? A delicious, fast and unbelievable easy dessert to make with chocolate! Yummy bites from White Chocolate to be specific! 2. Using a cooking pot warm the condensed milk and mix it with the white chocolate drops, the butter and the strawberry liqueur. 4. Add the cranberries and the biscuits that you have first chopped them in small pieces. Mix once more and you are ready! Easy isn’t it???? So have fun and delicious bites full of chocolate!!!! Wishing all the best for you and your beloved ones! This dessert is more than amazing! We ate them all in fewer than 10 minutes! hahaha… I am waiting your fudge delicious bites Vasso! Happy New Year Zina!!! The dessert looks so easy and delicious! Have to try it asap!!! I have tasted!!!! yummy yummy!!! τελεια! λατρευω λευκη σοκολάτα! θα τα δοκιμασω. Yummo! There goes the diet! Thanks for linking up at Tasty Tuesdays! I can't wait to see what you bring next week! hahaha! Thank you for you comment Cathy !